Sunday golf bags have their origins in some old traditions that involved caddies not working on Sundays -- hence the name. While there are obviously now plenty of caddies to be found on a Sunday afternoon, the golf bag itself lives in for many functional and convenient reasons. The obvious advantage is the smaller size of the bag, and the lighter weight it offers. No, you aren’t going to be able to store enough clubs for a full 18 holes on a standard course, but you can carry 6-7 clubs that will get you through an executive course, or maybe even just a driving range. If you’re off for a quick jaunt at the course, or just need to hit a few balls around, the Sunday golf bag gives you just enough storage for your essential clubs, and your essential accessories, such as gloves, balls, and tees. Sunday golf bags are very popular, and you certainly have p﻿﻿lenty to choos﻿﻿e from. We’ve narrowed down the best Sunday golf bags, broken down to two categories: under $50, and over $50. Sunday golf bags are relatively economical in their price points. These three products are a bit on the higher end, but absolutely worth the money. This bag from Palm Springs has a look that’s similar to a standard golf bag, and comes with plenty of storage as well. With enough room to fit anywhere from 6-8 of your favorite clubs, the bag is perfect for short courses up to 9 holes. For its size, the 3.5 lb weight is fairly low as well. Users will have an easy time carrying it, even when full. Double shoulder straps offer easy carrying during walks, with an added handle on top for lifting. Pockets are abundant with this bag. There are four exterior zip pocket for various accessories, a fleece-lined pocket for valuables, and even a mesh water bottle holder. If that’s not enough, there is also a velcro glove tab, a towel ring, and even an umbrella holder. The bag includes a rain hood that covers the to opening, and features a stand to keep the bag dry and upright during play as well. There are really no negative aspects to this bag at all, and it’s definitely on the lower end of the price scale. The CaddyTek Deluxe is a versatile and durable Sunday golf bag that is an affordable choice when looking for a higher-end version. It weighs just under 3.5 lbs, and is easy to transport thanks to a padded double strap. The CaddyTek Deluxe is made from extremely durable nylon fabric, so you know you will be using it for years. The bag’s 6.5” diameter easily provides enough space for your clubs, and boasts a 4-way top with 2 full length dividers to keep the club neatly organized. The top comes with a carry handle for easier lifting. Storage includes a large garment pocket and 4 other specific pockets for valuables, balls, accessories, and water bottles. The SKB Roto is not a conventional Sunday case by any means, but it does offer plenty of use for travel and﻿ transport, while still holding the same club amount as a standard Sunday case. Using SKB’s standard near “bomb-proof” materials, the Roto can be used to transport your favorite clubs as luggage, making it useful for flying. The case accommodates drivers up to 50 inches in length, and features military-style twist latches with padlock hoops that are compatible with padlocks of your choice. The case is actually surprisingly lightweight, with just a 7 lb total weight unpacked. As with all their products, SKB includes a lifetime warranty with the case as well. These bags may be cheaper than their counterparts, but their benefits are not debated. This bag from JP Lann is efficient in its use of space, and weighs in at under a pound. 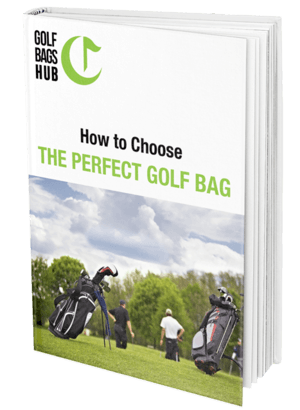 Despite its smaller size and simpler construction, the bag can fit up to 7 clubs easily, and includes a padded single shoulder strap for easy carrying on and off the course. The bag only includes one pocket, but the pocket itself is rather large, allowing you to store numerous items together. Polyester PVC gives the bag its soft, durable body that can easily be folded up to save space when not in use. A reinforced 6” steel ring top provides structure to the bag’s opening. By far the most economical bag on this list, the ProActive Sunday Bag is a lightweight and spacious way to carry clubs on the course. The bag includes 1 Mesh and 2 Zippered Pockets for accessories such as balls, tees, divot tools, or practically anything else. The bag’s durable polyester gives it longevity that will last for years, even with repeated heavy use. When not in use, it easily folds in half to save storage space. If you’re looking for the simplest of bags that doesn’t skimp on quality or even storage options, this bag is definitely worthy of a strong look. Sunday golf bags should be in every golfer’s inventory. They provide a level of ease and convenience not found with any other club-carrying method. As long as you know their limitations and benefits, you’ll be happy to use them when the time comes. Plus, their pricing makes them one of the more affordable gold accessories you’ll own. Have you used any of these Sunday bags, or have suggestions for your own? Let us know in the comments below!